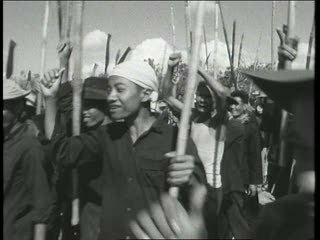 Civil guards armed with spears and other home-made weapons repel an attack by two well-organized companies of Viet Cong rebels, who fled leaving 80 dead and much weapons. 1. Civil guards raise their spears in celebration of win. 2. Guardsmen's victory parade. 3. Bodies of slain Viet Cong. 4. Rifles and mortars captured in the win. 5. South Vietnamese army officers. 6. Flags flying in the street. 7. Local girls decorate civil guards with garlands of flowers. 8. Crowd cheering. Chicago: “Vietnam: A Television History; Civil Guards with Home-Made Weapons Repel Viet Cong,” 03/14/1963, WGBH Media Library & Archives, accessed April 25, 2019, http://openvault.wgbh.org/catalog/V_E73D4656F39F4CD1815C19221B095262. MLA: “Vietnam: A Television History; Civil Guards with Home-Made Weapons Repel Viet Cong.” 03/14/1963. WGBH Media Library & Archives. Web. April 25, 2019. <http://openvault.wgbh.org/catalog/V_E73D4656F39F4CD1815C19221B095262>.